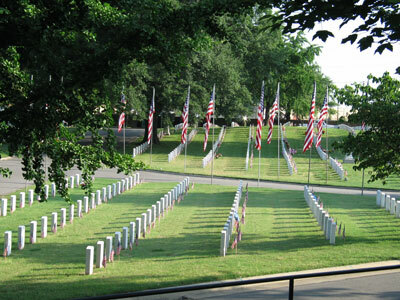 Fort Smith National Cemetery, located in Fort Smith, Arkansas, was established as a national cemetery in 1867. The cemetery grew around a small post cemetery that dates to about 1819. Fort Smith National Cemetery traces its beginning to the founding of the military outpost at the confluence of the Arkansas and Poteau Rivers. In 1817, the United States established a series of frontier garrisons in areas annexed as part of the Louisiana Purchase, including Fort Smith in northwest Arkansas. The first known burial at the post cemetery is that of the fort’s surgeon, Thomas Russell. In 1823, a major outbreak of disease claimed the lives of 25 percent of the troops stationed at Fort Smith, who were interred at the post’s cemetery. The following year, Colonel Matthew Arbuckle removed the five companies of soldiers under his command from the area in search of higher, healthier land to the west. The garrison remained unattended until 1833 when Captain John Stuart used the fort as an inspection station to intercept traders illegally selling whiskey to the local American Indians. His mission lasted just one year, and the post again sat vacant until 1838 when the Federal Government purchased land at the southeast corner of the Arkansas and Poteau Rivers, reestablishing Fort Smith. From 1841 to 1845, Zachary Taylor, later the 12th President of the United States, commanded the 2nd Department, Western Division, at the fort. In the years before the Civil War, the cemetery was improved and enlarged. U.S. Army Captain S. D. Sturgis, the post’s commander at the start of the Civil War, withdrew his men from Fort Smith upon receiving word of two approaching Confederate steamships carrying over 300 soldiers. When the Confederate army arrived on April 23, 1861, they found the fort empty. With Arkansas’ formal secession from the Union, the fort came under the control of the Confederacy until the summer of 1863. Troops from the fort took part in the Battle of Wilson’s Creek in 1861 and the disastrous Confederate defeat at the Battle of Pea Ridge in 1862. Occupied by only a small contingent of soldiers in August 1863, Union forces recaptured the fort and held it for the remainder of the war. The post cemetery was designated a national cemetery in 1867, but four years later, Congress authorized the War Department to dispose of excess military facilities, including Fort Smith. After U.S. Army Quartermaster General Montgomery C. Meigs pointed out that the land to be transferred included a national cemetery, President Ulysses S. Grant signed an executive order ensuring that the cemetery remained in the possession of the War Department. The cemetery’s first fence, made of whitewashed wooden pickets, was replaced in 1874 by a four-foot tall brick wall with cement coping. On January 11, 1898, a tornado struck Fort Smith, destroying the 1871 superintendent’s lodge and toppling a portion of the perimeter wall. A new stone wall with cement coping was built in its place and remains today around much of the original cemetery. Portions of the wall around the main gate and the service gates have been lowered or replaced with ornamental iron fencing set between stone columns. 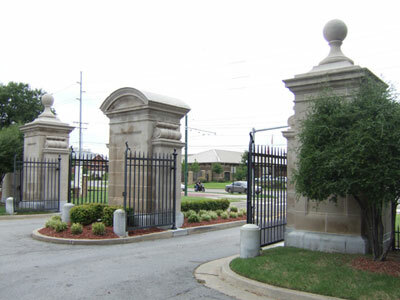 The main entrance to the cemetery sits at its northeast corner and features a double wrought-iron gate supported by stone columns. This gate, constructed in 1942, replaced the original Victorian-style gates, which were relocated to the southern boundary wall to serve as an entrance to the committal shelter located between Sections 16 and 17. The administration building, originally built as the superintendent’s lodge in 1904, is a two-story brick building with a hipped roof and a central porch; the porch has since been enclosed and converted into a foyer. Just past the lodge, along the main entryway, is a flagpole set within a circular plaza. On the other side of the flagpole, the road runs to the west before splitting in two, forming a small triangular section. All of the graves in the Fort Smith National Cemetery are laid in rows running north and south, except for four rows just south of this triangle that run northeast to southwest. On Veterans Day, 1986, AMVETS (American Veterans) dedicated a carillon for the cemetery that sits at the main entrance. Other monuments on site include the Vietnam Veterans Memorial, a granite and bronze monument dedicated in 1998, and the Memorial to the Unknown Confederate Dead. The latter also commemorates Confederate Brigadier Generals James McIntosh and Alexander Steen, both graduates of the United States Military Academy who resigned their positions with the U.S. Army to join the Confederacy. McIntosh, killed in action during the Battle of Pea Ridge in March 1862, is buried in Grave 1267, Section 3, Row 4. Steen, who was killed in action at the Battle of Prairie Grove in December 1862, is buried in Grave 1822, Section 4, Row 2. In all, Fort Smith National Cemetery is the final resting place for 473 Confederate soldiers. Also interred at the cemetery is Isaac C. Parker, known as the “Hanging Judge” for the 151 death sentences handed down during his tenure on the bench of the U.S. District Court for the Western District of Arkansas, which also included the Indian Territory to the west. After his death in 1896, local businesses closed out of respect during the elaborate funeral services held in town. Parker is buried in Grave 4000, Section 9, Row 3. Brigadier General William O. Darby, leader of “Darby’s Rangers,” a group of elite soldiers during World War II, is also buried at Fort Smith National Cemetery. This squadron was the basis for what would become the U.S. Army Rangers, and was the inspiration for the 1958 film Darby’s Rangers. Darby was killed in action in Italy on April 30, 1945, just days before the final German surrender. He is buried in Grave 3991, Section 9, Row 0. Fort Smith National Cemetery is located at 522 Garland St. and South 6th St., in Fort Smith, AR. The cemetery is open for visitation daily from 7:30am to sunset; the administrative office is open Monday-Friday from 8:00am to 4:30pm, and is closed on all Federal holidays except Memorial Day and Veterans Day. For more information, please contact the cemetery office at 479-783-5345, or see the Department of Veterans Affairs website. While visiting, please be mindful that our national cemeteries are hallowed ground. Be respectful to all of our nation’s fallen soldiers and their families. Additional cemetery policies may be posted on site. Visitors to Fort Smith National Cemetery may also be interested in the National Park Service’s Fort Smith National Historic Site, where the courthouse in which Judge Isaac Parker presided is open to the public. Fort Smith National Cemetery was photographed to the standards established by the National Park Service’s Historic American Landscapes Survey.